Strada Healthcare, Nebraska’s largest Direct Primary Care (DPC) practice, partnered with Burton Plumbing Services Inc. in 2017 to provide employees with improved access to primary care. 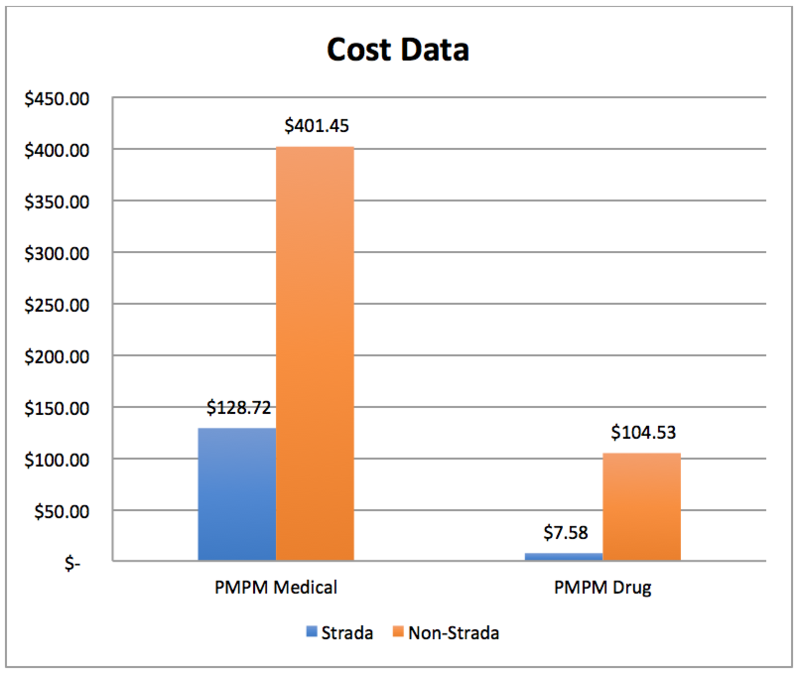 Strada is a disruptive model of healthcare which removes the headache of health insurance while providing nearly unlimited primary care for a low cost, monthly subscription. By removing insurance, DPC drastically reduces the amount of overhead costs and time spent on billing and insurance related activity. 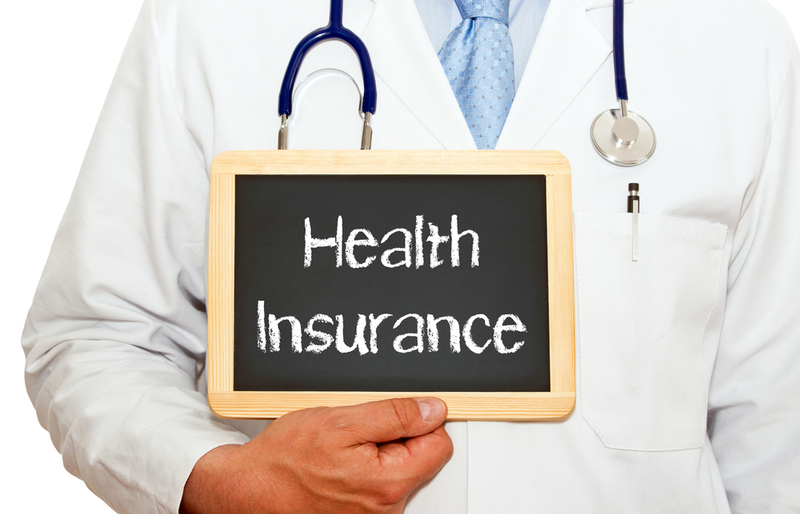 In 2012, insurance related activity cost the U.S. healthcare system an estimated $471 billion (1). Removing this burden allows providers the freedom to practice proactive, preventative medicine, improve access to care, and lower costs. Lower costs, better service, and improved health are a win-win for patients, providers, and employers alike. It’s simple, and the country has taken notice. The DPC industry has grown by nearly 500% across the United States in the past 2 years alone, and research suggests this statistic is severely under representative of true industry growth. Health insurance premiums cost $18,142 per year for the average family of four (2). Instead, that same family would pay $3,312 to access Strada Healthcare, which provides increased access via text, e-mail, phone, and in-person visits, personalized care plans, and stronger patient-provider relationships. With nearly unlimited primary care covered by a Strada membership, patients can save money by purchasing lower premium high deductible or catastrophic health plans to use as a wraparound coverage plan in case of emergency, surgery, and other non-primary care needs. Strada Healthcare utilizes the healthcare analytics and performance improvement firm, KPI Ninja, to measure and track key data metrics. Results of the analysis for Burton Plumbing, Inc. showed significant results. A $2,000 high deductible health plan that does not include Strada Healthcare. A $3,000 high deductible health plan that includes membership to Strada Healthcare. 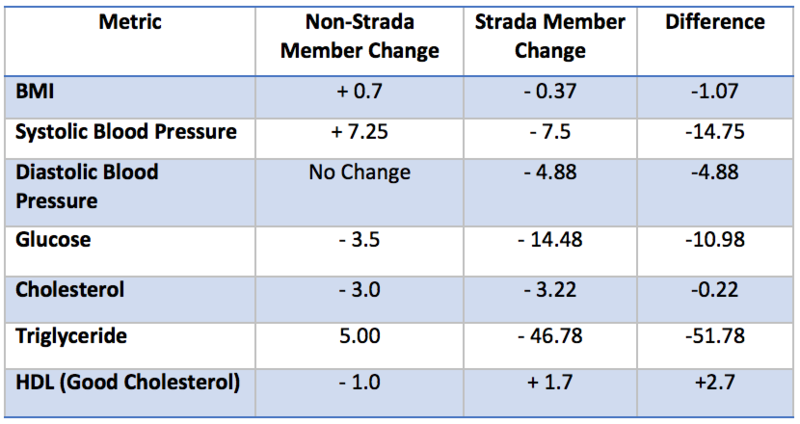 Within just 6 months, Strada members have seen health improvements. Blood pressure, blood glucose, cholesterol, and body mass index all demonstrate improvement. Triglycerides were drastically reduced, which illustrates early success of long-term preventative medicine. High triglyceride levels foretell various health conditions such as: heart disease, stroke, obesity, metabolic syndrome, high blood pressure, diabetes, and liver or kidney disease, among others. 53% of Burton employees and dependents utilized Strada’s virtual care services. 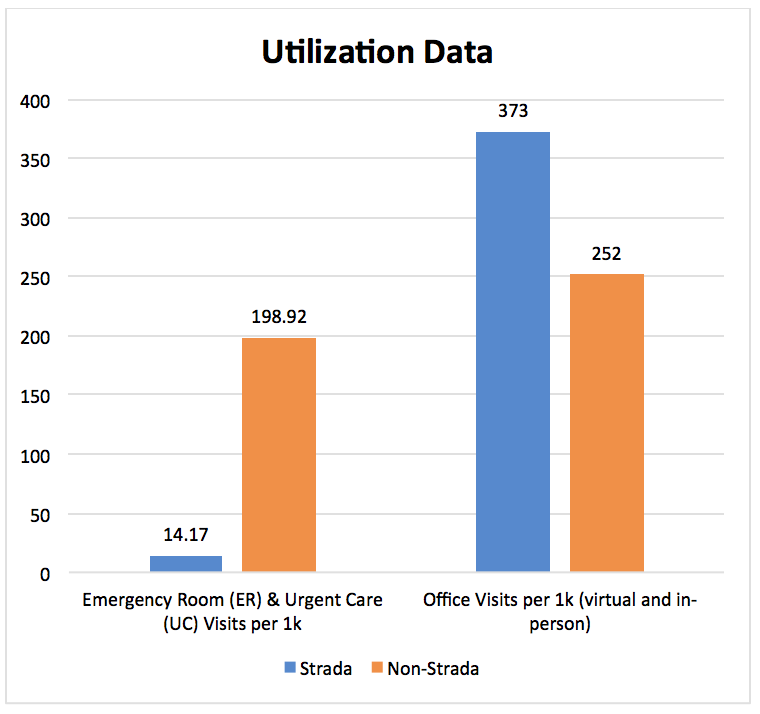 In the first 9 months, 85.5% of care provided by Strada was via virtual communication. 57% of virtual communication was provided by Strada during non-business hours. Such proficient use of virtual care via text messaging, picture messaging, phone, and e-mail saves time and hassle, and helps prevent unnecessary Emergency Room and Urgent Care visits. The difference is clear. Strada Healthcare increases access, improves employee health, lowers costs, and reduces ER & UC visits. After Burton Plumbing implemented Strada, reported worker injuries dropped from 2.6/month to .6/month. Average workers compensation claims dropped from $7887 to $431, and total workers compensation costs dropped from $102,534.54 to $1,295.67. I have a personal relationship with my provider rather than being a number. Access to healthcare is no longer an inconvenience. I enjoy having access to my provider via text messaging and next day appointments. Research has shown time and again that patient-provider partnerships and increased access to a consistent source of care in a timely manner improves health outcomes, and reduces specialist visits, tests, hospitalization, emergency department use, and overall costs (3, 4, 5, 6). During a 5-year longitudinal study, personalized primary care reduced hospitalization by up to 62% when compared to the control group, and lead to an overall 72% reduction in hospitalization. Patients were 97% less likely to be readmitted for heart attacks, 95% less likely to be readmitted for congestive heart failure, and 91% less likely to be readmitted for pneumonia (7). Meanwhile, researchers in Washington witnessed a 46% decrease in Emergency Room utilization coupled with a 48% reduction in inpatient encounters for DPC patients (8). In the traditional health care model, providers spend 3.5 hours per week on insurance activity, while nursing staff spend 4 hours per day and clerical staff spend 7 hours per day, per provider (9, 10). With Strada, providers and the care team can focus on patients, not insurance, which increases quality of care, patient satisfaction, and provider satisfaction. Petterson, S. M., Rabin, D., Phillips, R. J., Bazemore, A. W., & Dodoo, M. S. (2009). Having a usual source of care reduces ED visits. American Family Physician, 79(2), 94. Uscher-Pines, L., Pines, J., Kellermann, A., Gillen, E., & Mehrotra, A. (2013). Emergency department visits for nonurgent conditions: systematic literature review. The American Journal of Managed Care, 19(1), 47-59.